If you are an American adult, then it’s statistically probable that you already own an augmented-reality device. You may well be looking at it right now, in fact. According to a recent survey conducted by Walker Sands Communications, nearly 80 percent of adults in the U.S. own a smartphone, and when that phone’s camera is paired with an AR app, the phone becomes a bona fide piece of AR hardware. First up: AR for drones. If you want to get the most out of a drone flight experience, both in terms of fun and safety, then Epson Moverio glasses are the way to go. 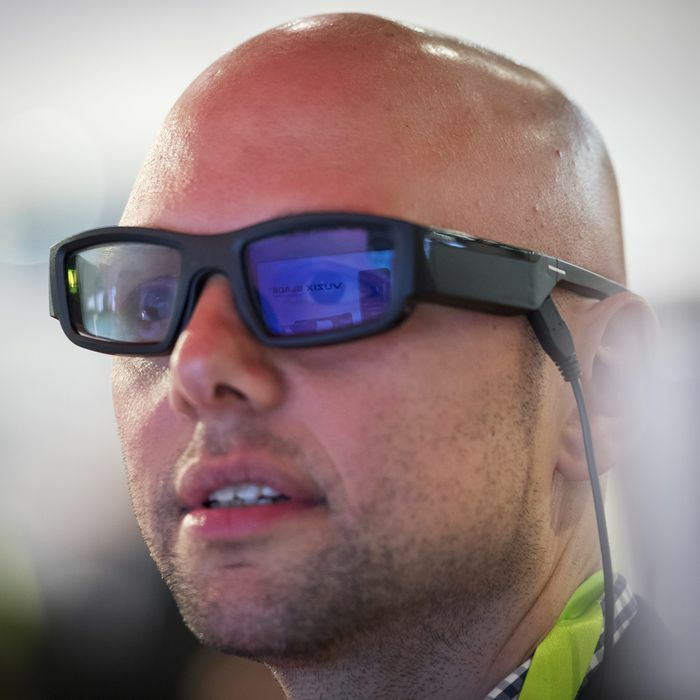 These AR glasses represent a perfect pairing of two types of technology, solving one of the biggest issues that remotely piloting a vehicle presents. In the past, a drone pilot had to constantly switch between watching the aircraft itself and looking down at a screen to see through the drone’s camera. With the view captured by your drone’s camera, overlaid on your Moverio glasses with much of your vision still preserved, you can watch your aircraft in flight and see what it sees (and exactly where it’s going) at the same time. This allows for safer, more accurate control and for better quality of video capture for media production, site or equipment inspection for professional applications, and for faster, nimbler racing. The Magic Leap One is probably most famous for being the subject of years of hype and an underwhelming debut, but despite some backlash in the tech press, most reviews have been mixed. The Verge sees “amazing potential” from the Magic Leap One AR hardware and calls the headset “surprisingly comfortable” — but acknowledges that the functionality was not fully realized due to glitches like the headset’s poor spatial perception. The headsets don’t have as many practical applications as other augmented-reality devices, but they’re a great choice for someone simply looking to take playtime up to 11. When used in conjunction with a handheld remote called Control, Magic Leap One is supposed to create immersive gaming experiences by overlaying virtual characters, landscapes, weapons, and other objects atop real-world surfaces like your coffee table, walls, or an open floor. The headset can also detect your hands without the Control, allowing you to interact with the virtual images projected before your eyes. You can create and manipulate virtual artwork, send showers of sparks dancing in time with music, or sit back and enjoy a light show created just for you. The glasses limit peripheral vision, so using them outside of contained, safe spaces isn’t a good idea, but at $2,295 they’re one of the more affordable AR headset options out there, so go ahead and consider getting yourself a super-fancy toy. A HoloLens headset isn’t a cheap purchase; it sells for about $3,000. But it’s self-contained; you don’t need to be connected to another piece of hardware by wire or wireless link, so you can move around at will, experiencing both the virtual and actual world freely in all dimensions. And as it preserves peripheral vision, you’re not going to trip over a chair while you do it. The headset also creates a three-dimensional audio experience without blocking the noise around you, so both your vision and hearing are a seamless blend between the virtual and the real. And despite being self-contained, multiple pairs of HoloLens glasses can be linked so multiple users can experience the same augmented reality at the same time. This allows for co-workers to examine virtual models of a product, for an architect and engineer to discuss a virtual worksite, and for students and a professor to study a virtual object (from an ancient artifact to a human skeleton) as if it’s right there in front of them. If you’re looking for an awesome AR gaming experience, then look away from the company Daqri. If you’re looking to make a workplace more productive, safer, and with better quality control, then their Smart Glasses deserve a closer look. This hardware was designed for professional use in industries ranging from manufacturing to health care to aerospace to IT and beyond; they can be of great use in any industry in which there’s an overabundance of information to deal with. By allowing for real-time overlays of data, graphics, numbers, and so forth, the headset puts a wealth of actionable information right where the worker needs it and in real time. And thanks to their capability for remote linking, they allow remote specialists to diagnose issues by looking through the headset’s cameras and indicating various points in the virtual space before the wearer; this could allow a world-renowned doctor to lead a surgeon at a regional hospital through a complex procedure, for example, or for an employee from an equipment manufacturer to lead a customer through a setup or repair process. Scott Stein wrote on CNET.com that Daqri’s Smart Glasses have “a wider field of view than the competition” and are ideal for the workplace of the future — but, as he acknowledges, one reason these Smart Glasses are best reserved for professional use is that they cost nearly $5,000. If you want AR glasses that will work seamlessly with your life, making everything from shopping to travel to social media that much easier and more enjoyable, then Vuizx Blade smart glasses are the way to go. This hardware wasn’t designed for the ultimate gaming experience or to help rocket scientists examine a virtual booster engine or anything like that; instead, they offer practical ways to enhance everyday life. Blade glasses can give you turn-by-turn navigation assistance, for example, or pop up information about a nearby noodle house with superb Yelp ratings. Or how about a weather forecast update or text message projected before your very eyes? Perhaps the best thing about Vuzix Blade smart glasses is the fact that they look almost like normal glasses, albeit a bit thick. You wouldn’t want to wear these on a first date or to a job interview, but unlike with almost all other AR headsets, you probably wouldn’t draw any sidelong glances wearing them on the street or subway. And no one would suspect you were watching a movie or taking pictures as you passed by.